The Department of Electrical and Computer Engineering ranks among the best in the country. Our research programs are at the forefront of the technologies that have changed the world we live in. Our interdisciplinary approach to education and research allows faculty and student across the university and beyond to collaborate on problems that have significant impact on the world around us. We consider our work to be closely intertwined pieces of a puzzle: the pieces in the three layers below interact within and across layers. 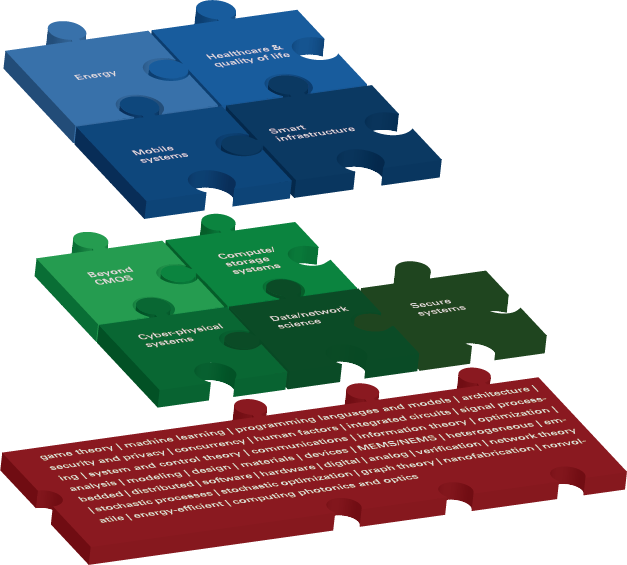 The layer of theoretical and technological foundations serves as a bedrock for our work in systems and technologies, where each puzzle piece represents a systems level, vertical line from the physical to the cyber, and application domains, where each puzzle piece represents a domain where our fundamental and systems level work makes significant impact. To innovate at the systems level and have impact in the real world, the discipline of electrical and computer engineering sits on strong technological and theoretical foundations.